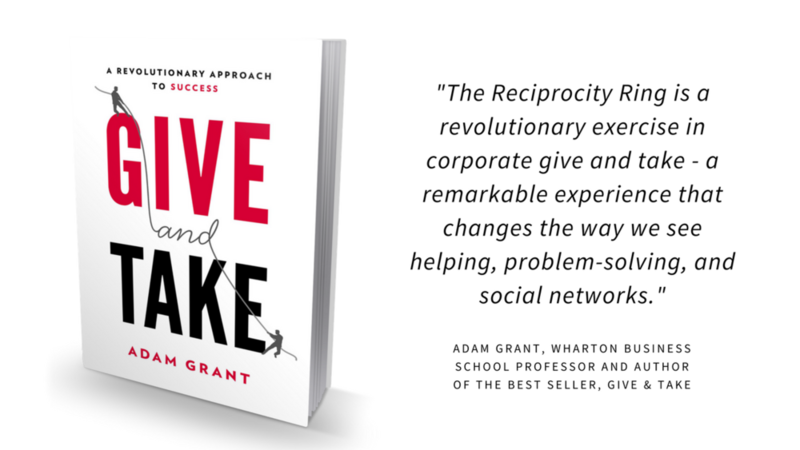 Achieve More In 2019 By Unlocking The Power of Reciprocity. Are You Ready to Try On The Ring? One thing we know for sure is that workplaces, organisations and communities thrive when people generously give help to one another. That being said asking for help and being receptive to help when it's offered is something many really struggle with. The really great news is that you can break those limiting habits for yourself and for your colleagues by learning how to unlock the power and practice of reciprocity. That’s what this unique workshop is all about. The Reciprocity Ring® is a high energy, group-level activity that enables participants to give and get help with things they really care about, generate high quality connections, strengthen networks, generate positive emotions and build social capital. Participants engage in acts of paying it forward while expanding their networks and gaining concrete benefits such as solving a problem, gathering critical information for a task, or receiving a referral to someone who can help with an opportunity or project. Each group of 24 people realises benefits valued at over $150,000 and saves over 1,600 hours of time. Many groups achieve even more! This powerful half-day experience that has been used to share the power and practice of reciprocity in order to build high performance teams, break down silos, create a culture of collaboration and change and generate new sources of value creation, creativity and innovation by hundreds of the worlds leading companies and educational institutions. And now it's your turn to try on the ring and achieve more in 2018. Are you ready to try on the ring and achieve more in 2019? We have multiple dates running throughout the year so please get in touch via the form below and we’ll find a date that works for you and your team.